Supplied complete with venting channel bin and lid. What is the purpose of a Rubbermaid Plastic Cup Recycling Bin? This product comes highly recommended for those who want to recycle their plastic cups after use, yet save on space. The slender profile of this product enables it to be stashed away in tight spaces, nearly eliminating the need to allocate a large amount of space to install recycle bins. 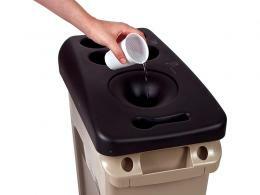 Where can a Rubbermaid Plastic Cup Recycling Bin be used? This product is ideal for offices, home kitchens, restaurants, supermarkets and other locations where recyclable waste is regularly generated. 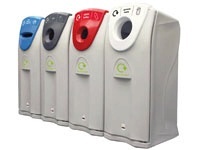 The slim profile allows the bins to be placed easily, while the recycle symbol make it visible to users. 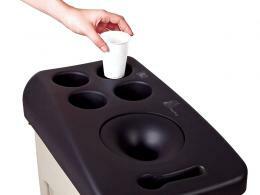 The product can easy be placed in convenient spots where the most amount of cups are usually generated, such as in offices, pantries, kitchens and other food areas. 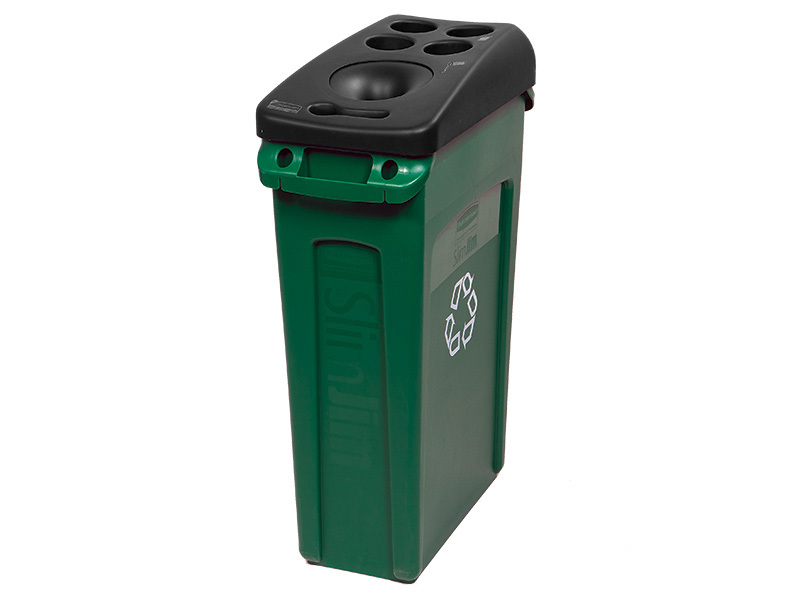 Anyone looking to save space with their recycle bins will find this product extremely useful. It is ideal for people who want to segregate their recyclable plastic cups at the point of generation rather than at the point of removal. Office managers, facility supervisors, restaurant and kitchen services managers, business owners of small eateries and many other people will testify to the efficacy of this product.